Adi Sankara, otherwise known as Bhagavatpada, had a remarkable career within a short span of lifetime of thirty-two years. He was not merely an intellectual philosopher of the highest calibre, but also an ardent devotee and a mystic poet singing in ecstasy of the bliss and beauty of the Divine Mother. The austere and serene philosophy of the Upanishads was combined by him with a mystic ardour and fervour to produce a balanced system which would satisfy the deepest religious instincts of the people and which to this day stands unrivalled in its brilliance and mystic appeal. Sankara, was, in addition, a practical reformer. He re-established the Shanmatas or the worship of the six ancient Gods, viz., the Saiva, the Sakta, the Ganapatya, the Vaishnava, the Saura and the Kaumara, and restored the influence of Hinduism among the people, with a belief in itself and in its capacity to satisfy the religious needs of its adherents. Just before Sankara appeared on the scene there was a medley of confused religious thinking in the country. On the one hand were the groups of karma-mimamsakas who concentrated on the precise and meticulous performance of the Vedic rites and rituals, independent of meditation and the soul’s worship of God. On the other were the nihilism of the Buddhists and the indeterminism of the Jainas. Kumarila Bhatta and Mandana Misra denounced the value of ‘jnana-marga’ and were exaggerating the importance of the strict observance of the outward forms of Vedic rites. The times were therefore ripe for an incarnation to appear on the scene and to re-establish the eternal truths of the Upanishads on a foundation of logical reasoning that could stand the severest tests of dialectical experts. As is common with the lives of our great men in the past, Sankara was more concerned with his teachings that with himself, and as such it is an extremely difficult task to weave into an acceptable pattern the events of his life. Sankara himself was a great writer, and has left us a remarkable collection of his writings, including his classic commentaries on the Brahma-sutra, the Gita, and the Upanishads, and such general works as the ‘Viveka-chudamani’, the ‘Upadesasahasri’, etc., which all reflect his general tenets. Unfortunately these do not contain even stray references to the biographical details of his life. However, a number of biographies by his disciples called ‘Sankara-Vijayas’ are available, the oldest and most trustworthy being Anandagiri’s Sankara-vijaya. Other works like the Sivarahasya, the Patanjalivijaya, Sankarabhyudaya, etc., also give us some broad events of his life. (a) The Cambodian inscription mentions one Sivasoma who styled himself as a pupil of Bhagavan Sankara. This Sivasoma was the Guru of Indravarma who is said to have lived from 878 to 887 A.D. It is therefore assumed that Sankara must have lived a short while before Indravarma and hence this Cambodian inscription is said to support the theory first propounded by Teile and Phatak that Sankara was born in 788 A.D and died in 822 A.D.
(b) The 75th verse on Saundarya-lahari of Sankara contains a reference to ‘Dravidasisu’ which is said to be a reference to Tirujnana Sambandar who is known to have lived in the 7th century A.D.
(c) Kumarila Bhattais generally assigned to a date earlier than 700 A.D., and hence Sankara is supposed to have lived sometime after him. (d) Sankara refutes the doctrines of Asanga, Nagarjuna, Dinnaga and Asvaghosha who are known to have lived not earlier than the 3rd century A.D.
(e) Sankara came later than Bhartrhari who is generally assigned to 600 A.D on the authority of I-tsing. (f) There is the chronogram ‘Nidhi Nagebha Vanhi’ which reversed, gives 3889 of Kali or 778 A.D. as Sankara’s birth date. Similarly the other chronogram ‘Chandra Netranka Vanhi’ gives his date of Siddhi as 820 A.D. The above are generally given as evidence in support of the theory of the western scholars that Sankara was born in 778 A.D., and died in 820 A.D. However, the evidence is far from being absolutely correct. The difficulty of identifying Bhagavan Sankara of the Cambodian inscription, with Adi Sankara is there. Dravida Sisu is said to refer to Sankara himself in Lakshmidhara’s authoritative commentary. The date of Kumarila Bhatta is not also free from doubt, as is also the date of Bhartrhari. Though Sankara refutes the Vijnanavada, he does not refer to Nagarjuna, Asanga and others by name. Hence it is possible that he may be refuting the earlier exponents of the same doctrine. The chronogram is also not free from doubt since the verse which contains it gives the date of Sankara’s birth, as Cyclic year Vibhave, Vaisaka masa, and Dasami tithi. This goes against the accepted tradition of his being born in Nandana year in Pancami tithi. Moreover this chronogram may not refer to Adi Sankara but perhaps to Abhinava Sankara who was a renowned Jagadguru of the Kanchi Kamakoti Pitham of the 8th century A.D.
Internal evidence about Sankara’s date is practically nil. There is a reference in the 18th sutra, 2nd adhyaya of the 1st pada to the cities of Srughna and Pataliputra. But Pataliputra was destroyed only in 756 A.D., and hence this does not help us to determine when Sankara was born except that it must have been before 756 A.D. Similarly in the same Bhashya of the Brahma-sutra, there is a reference to a king called Purnavarman. However, confirmation of Purnavarman’s date is also not forthcoming. There are the Guruparamparas kept in the Dvaraka, Puri, Sringeri and Kanchi Mathas. Out of these, the generally accepted date is about 500 B.C. whereas the ancient tradition of the Sringeri Matha takes it to 44 B.C. It is difficult to determine with finality the date of Sankara in view of the above conflicting evidence, though several attempts have been made by several scholars in the past. Although the biographical works on Sankara do not agree completely in all their details, still it is possible to ascertain the main events of Sankara’s life. He was born in Kaladi in Malabar to Siva Guru and Aryamba. At an early age he lost his father. He was precocious child who could pick up easily anything that came to his notice. One day while having his bath in the river, a crocodile caught his feet and he was saved from an untimely death by adopting the Sannyasa order and thereby attaining as it were a new life. He travelled all over the country and found his master in Sri Govinda Bhagavatpada on the banks of the river Narmada. After being initiated by him and mastering all that he had to learn from him, Sankara went to Benaras or Kasi and lived for some years there. It was during this period that his great works came to be written. Sankara then set out on a mission of conquest and met Kumarila Bhatta at Allahabad. Kumarila directed him to Mandanamisra living in the town of Mahishmati. After conquering him in debate, Sankara moved southwards and reached Srisailam. From there he went to Gokarna, Harihar, Mukambi, etc., and reached Sringeri. He was so charmed by the natural beauty of the scenery of Sringeri that he is said to have lived there for 12 years. At about this time he learnt that his mother Aryamba was on her death bed and went to Kaladi to attend to her funeral rites. He then set out on a second digvijaya and touched Ramesvaram, Chidambaram and Tirupati, and then started on a journey to Kailasa. En route he also visited Nasik, Somanath, Dvaraka, Ujjain, Mathura and Kashmir. Finally, he reached Badrinath and Kailasa. It was here that he obtained from the Lord the famous five sphatikalingas. From there he went to Kanchi after touching other Kshetras. At Kanchi he ascended the Sarvajna Pitham and ultimately attained his Siddhi also there. He established for the continuance and the correct interpretation of the Advaita doctrine propagated by him many Mathas and monastries all over the country, the most important of them being Sringeri, Dvaraka, Badri, Puri and Kanchi. During his digvijaya Sankara’s main purpose was to propagate the tenets of Advaita. He expounded his views by the well-known method of debate, in order to win round persons of the opposing view. Sankara derived his tenets from a strict interpretation of the truths contained in the Vedas and Upanishads. The truths of his doctrine are as simple as they are profound. According to Advaita Reality is one, viz., Brahman. This is immutable, inscrutable and without qualities. This by its own power of Maya appears to exhibit itself as the various phenomena of the seen world, though ultimately the entire corpus of universal existence is nothing but the original substratum. This principle of Maya is also inscrutable. Sankara does not deny the validity of the known world as is generally thought. He accepts it but denies any original and separate existence for it, apart from and independent of Brahman. 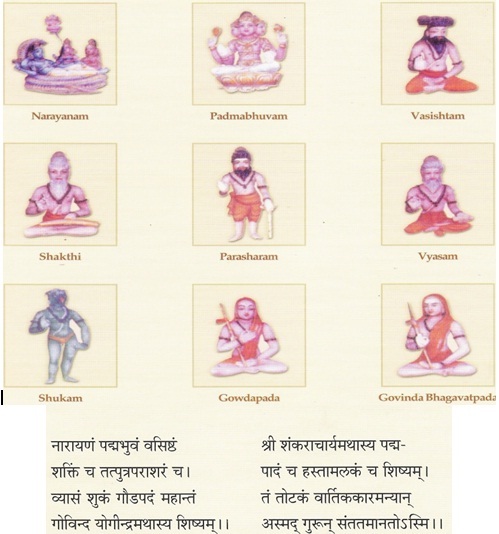 He propagated levels of truth, viz., the Vyavaharika Satya, the Pratibhasika Satya and the Paramarthika Satya. Thus, the relative existence of the known world is not a total non-existence, like the son of a barren woman. Some measure of reality is given even to the phantom world of apparitions and dreams called Pratibhasika Satya. The reality, being the plenary unconditional experience beyond the concepts and the categories of the mind, it is only Sruti that can testify to its truth. All the same a rational explanation of the contradictions that we see in the relative world becomes necessary and this reconciliation of the two seemingly irreconcilable principles is done in terms of the doctrine of Maya and Adhyasa. Adhyasa means superimposition, as for example the superimposition of the serpent on the reality of the rope. The problem of error has been very thoroughly discussed by Sankara, who concludes that the existence of error, though from the standpoint of ultimate reality, has to be denied, still has its own practical purposes. Thus Maya is ‘tuchchha’ or negligible from the standpoint of Brahman, and the question of its existence or non-existence at that level does not arise. But from the standpoint of common experience Maya is ‘Satya’ or real and of the world. The three ideas of truth, illusion and absolute non-existence, or in other words, ‘Satya’,’Mithya’, and ‘Atyantasat’, are expounded with the illustrations of the ‘Supreme one’, the serpent in the rope, and the son of a barren woman etc. The ‘Atyantasat’ is never associated with the word ‘is’ or ‘asti’. Sat is never associated with the word ‘is not’ or ‘nasti’. It is the second alone–Mithya, which is associated with both asti and nasti, as for example the serpent in the rope is at one time associated with the word ‘nasti’, from the point of view of ultimate reality, and at another time with the word ‘asti’ from the point of view of limited reality. The mundane world belongs to this category. Thus Sankara’s definition of the world is not that of an illusionist as has been misrepresented by some, who denies reality to that which is seen and felt by us, in our daily activities. Sankara has never said so. On the other hand, he reconciles our various experiences by the device of the various levels of truth.